Architecture is a variety of challenges that you have to overcome every day for each project . Although often tiring, there remains satisfaction from work well done and satisfied customers. Perfecting every day, I can not stop seeing new opportunities and solutions in architectural design. For me, architecture is an art directly involved with society, with building the environment, which helps each one of us to feel more comfortable, communicating with her. With every project I try to create more interesting and innovative architectural solutions. In my projects I always seek harmony and balance between the individual elements. Aesthetics and functionality, highlighted by colorful landscaping, are the leading motives in search of good and quality architectural solutions. My purpose is to create a complete and cozy environment to bring the calm to its inhabitants. KANSO is an architectural project inspired by Zen philosophy that creates a sense of movement, dynamics and a desire for expression in a natural way. The vision is a reflection of the dynamic and modern way of life, balanced by clear forms, highlighted by natural materials. KANSO is a composition of two buildings. BUILDING 1 is designed with a less floors and located in the south part of the property, and BUILDING 2 is ten storeys and is designed in the northern part of the property. Their position is in line and investigated with the summer and winter solstice, for providing permanent natural light and sunbathing the apartments on the ground level. Each building has two residential entrances for differentiation of smaller common parts. The complex is located near Tsar Boris III Blvd. and Alexander Pushkin Blvd, but far enough away from the city noise in order not to disturb the comfort of the residents. KANSO is impeccable quality, functional distributions and stylish architecture. 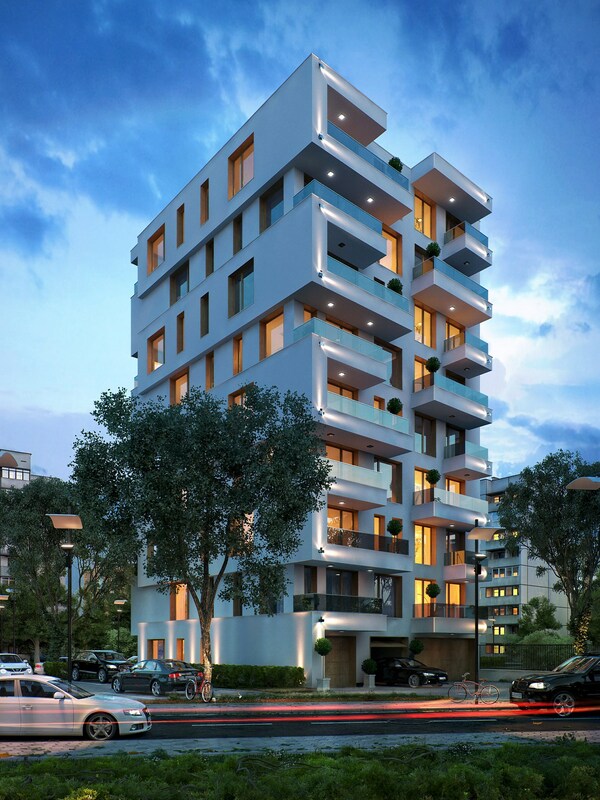 KANSO is purity, elegance, coziness and harmony creating modern lifestyle. KANSO is an addition to nature, through the input materials - stone, wood and iron, outlining a clear composition. KANSO is a good example of contemporary architectural solution. Total built - up area 12 147 sq.m. 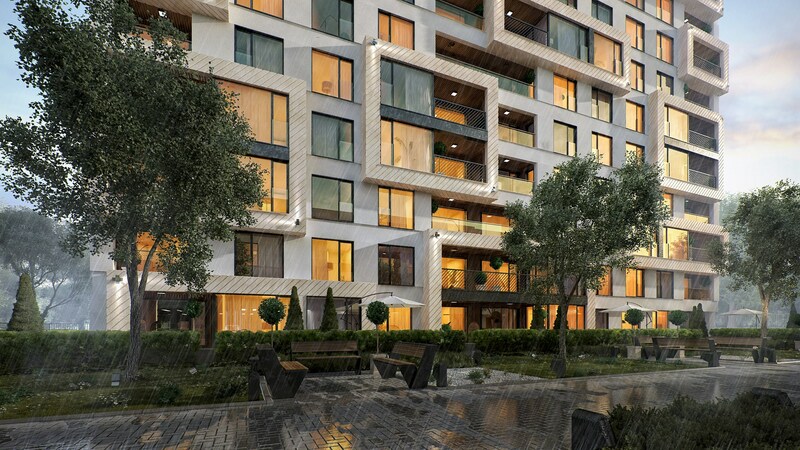 The new building in COMFORT RESIDENCE family is located in one of the fastest growing neighborhoods in Sofia - Ovcha kupel, near metro station, hospital, day care centers, market and large green areas. 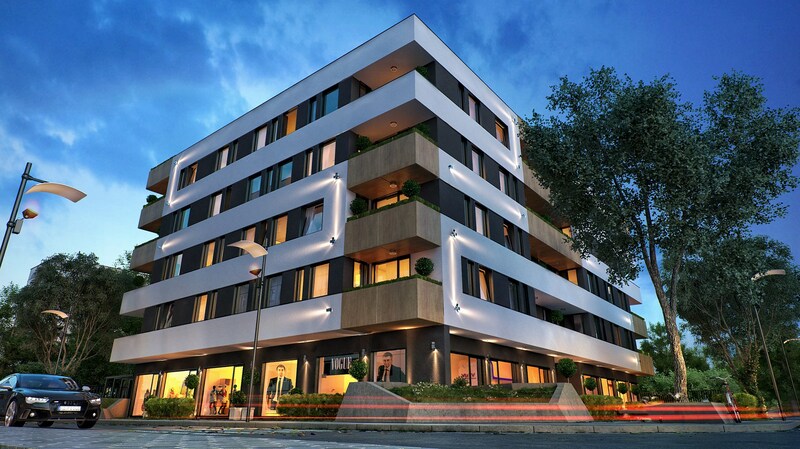 In the six-storey residential building are situated 42 apartments with the most favorable views to Mountain Vitosha. Appartments are functional and tailored to all the needs of their future owners. On the ground floor there are nine shops, two garages, and a parking for bikes. Approach to the underground level is covered with green pergolas leading the cars to the adjacent parking lots for each apartment. The residential entrance to the building is surrounded by asymmetrical green areas with seats for recreation spilling from the vertical planning, which is designed in harmony with the overall concept of facade. Apart from its excellent location, COMFORT RESIDENCE is also distinguished by its extremely modern vision. String geometric shapes are the basic element to achieve the modern look. The architectural style of the building is minimalistic. The big volumes predominate, the main purpose of which is to accentuate the simpler beauty of COMFORT RESIDENCE. The dynamics on the facade are characterized by the contrast between the white color symbolizing purity and gray, which adds depth. HOPE RESIDENCE is a residential building located at Yordan Hadzhikonstantinov - Dzhinot Str an area built mostly with one-size-fits-all buildings from the recent past, with pronounced cubic forms. Taking into account the surrounding environment we designed a building that stands to its time with modern volumes, cleansed lines and is at the same time part of the surrounding area ensemble. The building is designed at nine aboveground floors and an underground. On the ground floor there are separate retail spaces and individual garages as well as spacious antechamber and vertical communication. Housing levels are separated by two spacious apartments, respectively with three and two bedrooms and maximum absorbed beneficial exposure through windows type "french". The volume solution of the building is clean and with clearly expressed forms. Demanded is dynamic by retreating the balconies of different stages, as well as translation in a vertical direction. The façade layout of the building is designed entirely with white plaster, which creates cleanness and sophistication. The main emphasis is on framing around windows with HPL boards. The railing is from triplex for ephritality and clearer read on the volumes of the building. Total built-up area 2165 sq.m.